So far our club has only attracted helpful and friendly members keen to get stuck in with this most rewarding of hobbies. We have a warm and multi functional club house with a presentation suite, kitchen, computer room and a cosy bar area - the ideal place to put your feet up and relax after a great day in the air. Our unique site is surrounded by safe landable fields and the runway pattern allows us to launch and land into the prevailing winds. We are surrounded by major navigational features including the town of Selby to the North, Drax Power station to the East and Eggborough Power station to the South - this makes it easy for both trainee and solo pilots alike to always know their position whilst flying from Burn. In summer it's a great location from which to make your first cross country flights due to the flat landable terrain, and in winter we can stay aloft for hours, courtesy of the power station plumes and the mighty Pennine wave. The ASK13 two seat training glider has a steel tube framed fuselage and fabric covered wooden wings. It is strong, responsive and very forgiving, offering trainees an ideal platform on which they can practice and perfect their flying skills. The glider has been part of the training fleet for over 50 years, but it is still as relevant for training exercises today as the day we bought it. 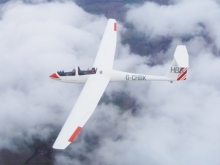 We have two ASK21 two seat training gliders which have a glass fibre fuselage and wing structure. They are the workhorses of our pilot training programmes. They are the most popular two seat training aircraft in the UK, offering slightly better distance flying performance than the ASK13. We use them both for normal flight training and for flight conversion training for other glass fibre construction aircraft. For solo pilots they can also be used for other advanced training such as aerobatics. The Janus C/F two seat training glider has a carbon fibre and glass fibre structure. It is the giant of our fleet with with flaps and a larger wingspan designed for distance flying. We use it for more advanced solo pilot training in the use of flaps, to teach efficient techniques for cross country flghts, and for conversion training onto advanced single seater gliders. Similar to the ASK21 the Twin Astir is a two seat training glider made of glass fibre construction. This glider is privately owned, but the club has an agreement to use it from time to time as an air experience and training flight aircraft. We have a superb single seat glass fibre PW5 glider which is the ideal glider for new pilots to make their first single seat solo flights. 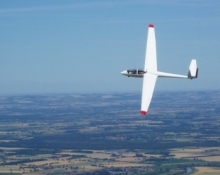 It is fun to fly and make the ideal club glider, both for general single seater flying and as a stepping stone for some members prior to them buying a share in a single seat glider of their own. The Rotax Falke Motor Glider two seat training aircraft has a steel tube framed fuselage and fabric covered wooden wings. It is ideal for air experience flights, flying currency checks and field landing practice/training. 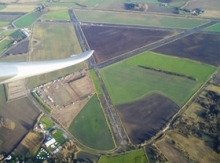 A Motor Glider ensures flights as long as you choose, no matter what time of year. The version we have is also capable of aero-tows of small and medium weight gliders. The Pawnee does most of the aero-tow flights at Burn as well as being an invaluable asset for retrievals from neighbouring airfields. Designed for crop spraying in America, it has the power to tow any glider, or up to two gliders at once, to the height and position of their choice. Note: The Clubhouse phone is not manned. Please leave a message or send an email if no answer. Voucher bookings will be advised on the day by phone if flying is cancelled due to bad weather. The Launch Office does not have an answering service and is only available on flying days (Thurs, Sat & Sun).